Nautical Units of Distance and Speed. The measurement of distance on the Earth's surface is simplified if the unit of length is related to angular measurement. In navigation, the unit of length is the nautical mile, which may be regarded broadly as the length of one navigational minute, 1', of are measured in a North-South direction. Since the Earth is not a perfect sphere the length of one minute of arc varies from 6108 feet at the Poles to 6046 feet at the Equator, so in the past an average length of 6080 feet was assumed for practical navigation, and this figure is still quoted in obsolete and unrevised textbooks. 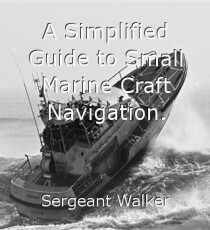 However, the International Nautical Mile represents the length of one minute of arc of latitude measured in Latitude 45°, namely 1852 meters (6076 ft.), and whenever a nautical mile in this book is referred to, then this is the length it should be taken to represent. The two variations of the nautical mile as described above, is a standard unit used for all practical calculations in Navigation. It should not be confused with a Sea Mile, which is the length of one minute of arc, measured in a North—South direction, in the latitude of the position; the length of a sea mile is not constant and will vary both with the latitude and the Figure of the Earth in use. Similarly, neither the nautical mile nor the sea mile should be confused with the Statute Mile, which is an arbitrary unit of length used in the U.S.A. equivalent to 5280 feet, or alternatively 1609 meters. In practice, the symbol ' is used to indicate both nautical miles and minutes'of arc. Therefore, 5' of latitude = 5 nautical miles, and 45'.7 of latitude = 45.7 nautical miles. The unit of speed in Navigation is called the Knot and this is equal to one nautical mile per hour. A craft, which is sailing at 8 knots is moving at a speed of 8 nautical miles per hour. However, it would be incorrect to say 8 knots per hour, as a knot is not a nautical mile and such an expression would be equivalent to saying 8 nautical miles per hour per hour. Pleas, Praises and Promises: A Personal Devotional Guide to 36 Two-liner Psalms for People on the Go!